Friends currently putting their place on the market. Had visit from estate agent last week. This EA has 30% market share in my city. The assessor was one of the partners in the business so I've a little more confidence in believing the numbers (not that I wholly trust what EA's have to say!). She said that house sales were as follows. Maybe quieter until government spending review? Seems that things may have picked up a little recently or maybe the people who were holding off have now taken the plunge hence the spike. Many of the property sold was apparently very similar to my friends place. 3-bed semi or 4-bed detached in leafy suburb. Some numbers would be good. Great news, our young friends have SOLD their house. they have also found a place to go to. Sadly, they are taking the 6 times joint mortgage offer to do it. I knew they would...they were terrified at first, but the draw of the better home and future profits is irresistable. Purely as an aside, and I suspect no motive on the part of the EA, but there never was a FOR SALE board on the property...but the DAY the thing was SSTC, a Board magically appeared. They were apparently too busy to put a board up. To clarify, these are the EA's own sales figures. Isn't there always more sales in October compared to Aug & Sep? Any figures? People might find it awkward to buy, when they are abroad on holiday. Buy October get in for Christmas. ....Many of the property sold was apparently very similar to my friends place. 3-bed semi or 4-bed detached in leafy suburb. And I'm sure the vendors of flat they visited next were told that many of the pick up in sales they've had were 1 bed city centre flats! I think you're friends have read too much into EA salesman spiel. I totally agree. Interestingly they had the place priced up in early 2007. No prizes for guessing how much the EA is recommending that they market it for now in 2010! I’m keeping a close eye on this one. Ahhhh...so how many have they actually sold in these months...SSTC mean nothing at the mo. As you say (now I get my head round it,) that seems like quite a spike in October. Interestingly, we're seeing a similar thing around here in Farnham - much more stuff went SSTC in October and early November - but unless it's actually completed and on the Land Registry, I'm afraid I tend not to believe it. EAs around here seem to use SSTC and Under Offer interchangeably, so to me SSTC no longer appears to mean it's a done deal. Things are hanging around an extraordinary long time here, before coming back on as available. For example, you'd imagine something that "went SSTC" in April would have been on the LR by now - but lo and behold, back it comes on the market again as Available, on Friday. 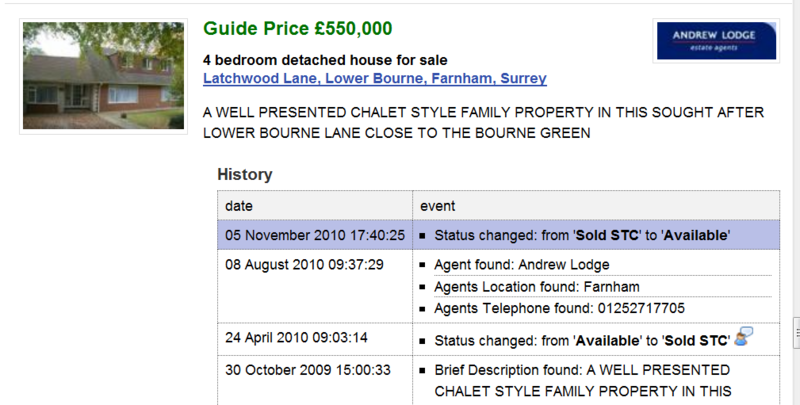 Also, Warren Powell Richards seem to have listed a load of stuff on Rightmove, straight on last week as "SSTC," and whilst Strutting Plonker have had a bunch of stuff also go "Sale Agreed" in the last few days, I happen to know one of the vendors personally who is "really disappointed" with the figure they've agreed on, and will likely pull out at the first sign of any delay or last-minute shenanigans by the buyer. So, to me SSTC means nowt until it's on the LR - and there's plenty allegedly SSTC around here which are nowhere near that yet. PS, yes I know the LR lags by three months at least - but the example above is just one of a number around here, that are coming back on as available after much more than that period of time. 6x - they are mad. at 4x you can get by on one salary and still manage but 6x you are dead in the water if one person loses their job. Is that on IO or repayment and at what interest rates? I dont know the details....I was told by Mrs Loo they were told they could get £170K....She (Our friend) said at the time it was totally ridiculous....it would take all their money. Seems though, that once proffered, and seeing a few places, the temptation for the "lifestyle" is just too much. The EA had overvalued the home above current mouseprice results for the area. If I find out more Ill let you know. As another point of interest, a place 400 yeards from us sold a few weeks ago for £50K more than the 2008 sales price. It has a builders fence around and planning for two dwellings. A friend of mine works for the local authority in Herts carrying out searches. Last week she told me that she is innundated at present and run off her feet. So houses are selling, ready for occupancy at Xmas but it tells nothing about price. wow, thats the first time in recorded history Ive EVER heard that from a public sector employee. Surely you can tell how the market is doing by looking at the house prices sites like http://www.houseprices.co.uk/. These obviously show the numbers sold as well as prices. Yep I always use houseprices.co.uk. Also, the only thing I monitor is the total available properties fitting my criteria on RM as all that matters to me is the supply overhang ie not how many are going sstc (as even more new instructions could be being added or vice-versa). A lot of times, sellers ask that a board NOT be put up until after the place has sold (wanting to keep it quiet for neighbours, or not wanting people to know how long it's been on the market). In a way, it's also free advertising for the agent so you can ask for a reduction in the agents fee if they put one up. Once it's sold, the agent wants to trumpet that they are good at selling to get other properties on their books.